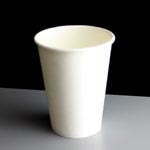 We stock a large range of paper cups, meaning we have a cup suitable for any occasion. All of our paper cups are made from food grade paper, are recyclable and very environmentally friendly too. Sip thru lids are available for all sizes, making them an ideal take away option. 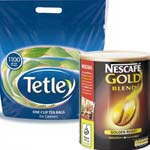 A selection of plain white paper coffee cups suitable for hot and cold drinks. A selection of plastic smoothie cups and lids all made from recyclable PET plastic. 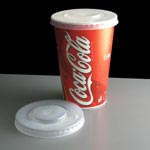 A range of polystyrene drinks cups and lids ideal for both hot and cold drinks. Available in 3 different styles, we stock single walled Bistro cups, a double walled Tuscan café cup and an insulated weave wrap Rustic Cup. There are matching sip through lids for all sizes too. 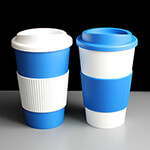 All styles are great for both hot and cold drinks, look great in Café's and Bistros, and save on washing up too. Rustic weave cups are great for hot drinks, as you don't need a cardboard sleeve when using them. Constructed from a weave wrap food grade material, Rustic cups are the best choice for protecting hands and keeping your drinks warm. Sizes range from 4-16oz, and all have matching lids. 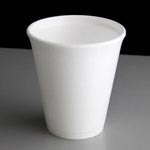 Single walled Bistro cups are less costly yet have a contemporary fresh design. They are manufactured by Solo, who supply Starbucks worldwide. 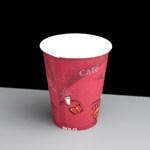 Available in 4oz-16oz cup sizes, these cups are quite often bought without sleeves. We also stock coffee cup sleeves for the most popular sizes. Tuscan cups are made from double walled food grade material, so offer protection against the holders hands.They are manufactured by Solo, who supply Starbucks worldwide. An ideal take away cup, they are great for tea and coffee and are available in an 8oz, 12oz and 16oz. Click to buy our Disposable Paper Coffee Cups online today. Do you sell Coca Cola products? 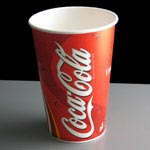 We have the solution - Coca Cola branded cold drink cups! Available in a 9oz, 12oz, 16oz and 22oz, all with sip through lids. Great for kids drinks, in Cinemas, coffee bars and fast food restaurants. 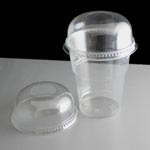 These cups are have a double poly coating and are made from food grade materials. The brand speaks for itself! Click to buy our Cold Drink Paper Cups online today. 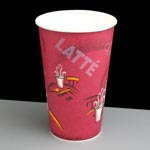 Our white paper cups are manufactured by Solo, who supply to Starbucks worldwide. 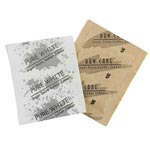 They are made from a thick premium food grade paper with a single poly coating and are a single walled cup. If you fancy a clean look, then these are the cups for you. Sizes available from 4oz all the way up to a 16oz. Perfect for hot and cold drinks - you can also write/draw on these cups too, making them great for kids projects! 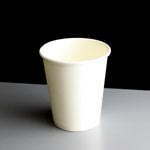 Click to buy our White Paper Cups online today.